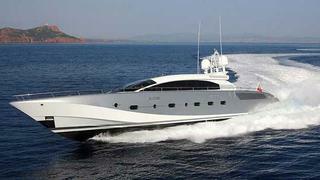 Here's another central agency change as the Yachtzoo team lists the 38m fast motor yacht Shooting Star for sale. Winner of a 2012 World Superyacht Award for the most outstanding two deck open semi-displacement or planing motor yacht, Shooting Star is a high-performance motor yacht launched by Danish Yachts in March 2011. Designed by Espen Øino, Shooting Star was built in carbon fibre and is capable of speeds in excess of a blistering 45 knots powered by twin 4,613hp MTU engines driving waterjets. A light, airy interior by Art-Line provides accommodation for up to 10 guests. Shooting Star is asking €14.5 million.